The three-day AIA Conference on Architecture kicks off in New York City today. To coincide, here's an overview of some of the largest and most high-profile construction projects currently taking shape across the metropolis. 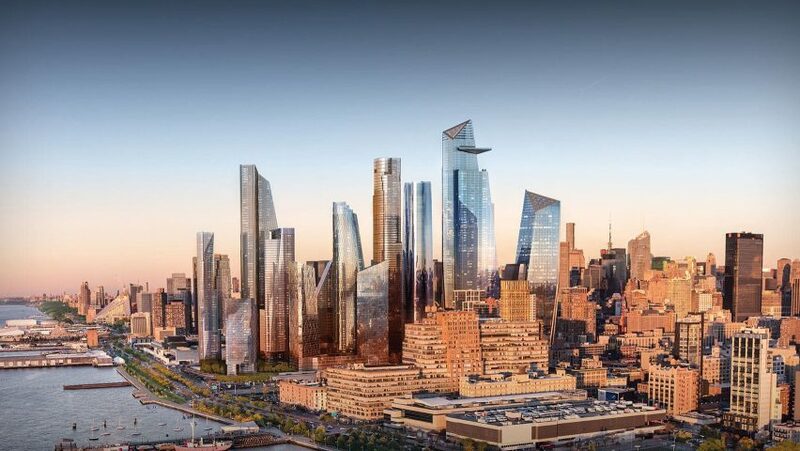 Described as New York's largest urban development since Rockefeller Center, Hudson Yards is a $20 billion mega project on Manhattan's West Side that will create a new neighbourhood of residential and office skyscrapers, schools, hospitals, retail spaces, parks, cultural venues and public art – masterplanned by Kohn Pedersen Fox (KPF). The 28-acre (11-hectare) site is bounded by 30th Street to the south, 34th Street to the north, Tenth Avenue to the east and Twelfth Avenue to the west. To create such a large parcel of buildable land, engineers have devised and constructed a platform over the West Side Rail Yard, which is being built in two stages. The first half will support towers by KPF; Foster + Partners; Skidmore, Owings and Merrill (SOM); and Diller Scofidio + Renfro and Rockwell Group – which have also designed an expandable arts venue at the base called The Shed. A giant sculpture by Thomas Heatherwick, formed from a giant honeycomb of interlinked staircases and named The Vessel, will set at the centre of the site. Some of the phase-one skyscrapers have reached full height and others are not far behind, while 10 Hudson Yards by KPF was the first to complete in 2016. Just a stone's throw from Hudson Yards – and also built over rail yards – another development is expanding the skyline of Midtown West. The SOM-designed Manhattan West includes two large office towers, two smaller residential buildings, a hotel, and the refurbishment of a 1960s office building at 450 West 33rd Street. The concrete core of the first office tower, 1 Manhattan West, recently reached its full 67-storey height, with construction expected to complete in 2019. Its neighbour, 2 Manhattan West, isn't expected to rise until it finds an anchor tenant. Of the residential buildings, 3 Manhattan West – also known as The Eugene – completed in 2017, while the other two are still reportedly in planning stages. One Vanderbilt is expected to become the city's second-tallest building. Measuring 1,501 feet tall, it will overtake Rafael Viñoly's skinny 432 Park Avenue but fall short of One World Trade Center (1,776 feet, 541 metres). The glass-sheathed, spire-topped tower by KPF will encompasses a full city block to the west of Grand Central Terminal. The project also involves the overhaul of access to some of the station's subterranean platforms and concourses. It will contain retail spaces and a large atrium across the lower floors, and 1.6 million square feet (148,644 square metres) of office space above. The ground-breaking ceremony took place in October 2016, and completion is expected in 2020. Redevelopment of the World Trade Center has been ongoing since the 9/11 terrorist attacks destroyed the Twin Towers and other structures in the area of Downtown Manhattan, and a masterplan by Daniel Libeskind was selected for rebuilding the site. Much of the work is complete, including the memorial fountains set in the footprints of the former towers, the museum that emotionally recounts the site's history, and the Oculus transit hub by Santiago Calatrava – which are all visited by millions each year. Finished office towers on the site include David Childs' One World Trade Center – New York's tallest – Fumihiko Maki's Four World Trade Center, and Rogers Stirk Harbour + Partners' Three World Trade Center, which only recently celebrated its completion. However, several of the components are still either under construction or on hold. The cube-shaped performing arts centre by REX is currently rising, while Two World Trade Center is yet to make it above street level – after Foster + Partners' proposal was replaced with a design by BIG, then the anchor tenant pulled out. As of December 2017, the site's St Nicholas Greek Orthodox Church – designed by Calatrava to replace its 19th-century predecessor – is also stalled over unpaid bills. The project, masterplanned by SHoP Architects, involves renovating the original brick factory building and constructing several new mixed-use towers on the surrounding land. A six-acre park designed by James Corner Field Operations (of High Line fame) recently opened along the waterfront, following the completion of the first new building on the site by SHoP. The other towers – some designed with holes in, so as not to block views of the water from inland – will finish in stages over the coming years. Long a source of frustration for New Yorkers and visitors alike, LaGuardia Airport in Queens is in the midst of a major revamp involving the gradual demolition of its existing terminals, and rebuilding them as a unified building with a larger capacity and improved access. The project is led by HOK, and partly informed by an amalgamation of designs by SHoP, Dattner Architects and Present Architecture. As part of the plans, passengers will access gates via raised pedestrian bridges that will be high enough for aircrafts to pass underneath. Construction is being done in stages to allow the airport to continue operation, starting with Terminal B then continuing with C and D. The first part is due to open as early as 2019, but the full project isn't due to complete until 2026. There are also plans in place to improve John F Kennedy Airport in Queens and Newark Airport in neighbouring New Jersey, which both also serve New York City, but work is yet to commence on either. Well-known names Rafael Viñoly, Richard Meier and KPF have all been tapped for Waterline Square – a five-acre development that completes the long-delayed Riverside Center project in the Upper West Side. Each of the firms has designed a residential tower for the site, all with glass facades and angled tops. Located along Riverside Boulevard, between West 59th and 61st Streets, they will surround a public park at the centre and connect to the nearby Riverside Park and Hudson River Park. All three skyscrapers are well underway, and set to complete in 2019. Have we missed any? Let us know in the comments section below!